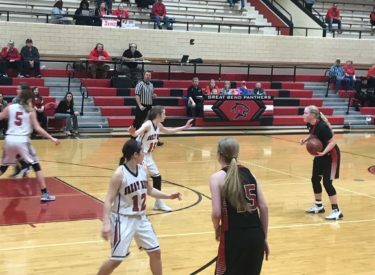 It Was a productive weekend for Liberal’s Lady Redskins. One night after moving into first place all alone thanks to a Hays loss at Garden City, LHS took care of their own business. Liberal breezed past Great Bend 52-26 Saturday night at Panther Fieldhouse in Great Bend. Katie Horyna led Liberal with 23 points. Aubrey Warden and Machia Mullens added seven a piece. LHS led 14-10 after one quarter and 29-15 at halftime. The Lady Red led 42-22 at halftime. Liberal is 17-1 and 5-1 in the WAC. The Lady Panthers are 3-16 and 1-6 in the WAC. Liberal hosts Garden City Tuesday night at 6 for Senior Night. Redskin Pregame begins at 5:45 on 1270 and kscbnews.net.